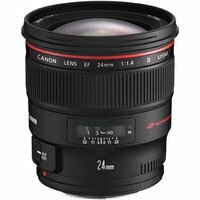 The Canon EF 24mm f1.4L II USM lens is a fast aperture prime lens that replaces EF 24mm f1.4L USM. Featuring UD and aspherical elements to eliminate distortion and aberrations, it produces high-quality wide-angle images and is ideal for both portraiture and landscapes. Canon EF 24mm f1.4L II USM lens has wear and dust seals, making it ideal for location photography, and benefits from Canon's fast, quiet USM autofocus system.